The 2008 European Section show held in Budapest was one that brought back bad memories to many exhibitors due to the numerous traffic problems. But this did not happen again this time. There was no queue at the gate and the first 4,776 dogs and their owners managed to get in well in time. No less than 72 countries participated and made the prefix “World” not an idle word. Hungary itself had 3,374 entries, followed by Russia with 2,837 dogs and Italy with 1,734. But dogs came from as far as Argentina (17), Australia (13), Brazil (38), South Korea (5), Egypt (6), Ivory Coast (4), Indonesia (2), Iceland (1), Israel (40), Japan (41), Canada (20) , China (8), Kazakhstan (5), Kyrgyzstan (1), Colombia (1), Malaysia (1), Mexico (20), Philippines (1), Peru (3), Puerto Rico (4), Taiwan (1), Turkey (7), Uruguay (1) and even Rwanda (2).The United States had a good entry of 57 and the United Kingdom had 215. Amazing in fact! The whole first day went on smoothly. 3 groups were on the start of this first day, group 3, the Terriers, Group 4 the Dachshunds and Groups 5, the Spitz and Primitive breeds. That was enough to start with, as group 5 can very large on big shows like this, as even very rare breeds can show up. The best scoring breed was the American Staffordshire with 420 specimens. The second largest group was the Siberian Husky with 199 entries. Other high scores were for the Akitas who had 150 entries while the American Akitas were with 158 altogether. Imagine 156 Pomeranians turning around their leasches or looking up to their masters, 189 Jack Russels making noise, and 169 Staffordshire Bull Terriers hanging on the leasches and no less than 172 Yorkshires trying to please their masters playing statues on their red little tables. And here is another list, the rare breeds. Ever seen a Hokkaido or a Kai ? Two very rare breeds outside Japan and, even in Japan, they are regarded as special. Do you have any idea how a Jämthund looks like? Or a Korea Jindo Dog? And what about the Thai Bankaew Dog? It was somewhat cloudy, but no rain was to be expected. Important as in HUNGEXPO, the showground, the Pavilions were not linked and going from one hall to another meant going out. But so far, with the nice weather, this looked the perfect place to be, cozy and with lots of stands with goods and food for sale. Again, there were no traffic problems or whatever, there was no rain to spoil things, and so there were little or no complaints. The Hungarian canine organisation also worked in a much closer cooperation with the police than in 2008. That measure and a few small changes did wonders. Maybe that is why everything bathed in a more relaxed atmosphere. If one is already overstressed before everything starts, you can only expect a bad temper and troubles to come. 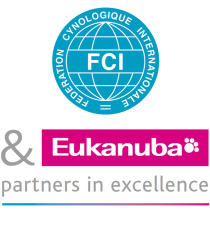 On this second day, there was one group on term, the biggest group in FCI system - the Guard and Protection dogs - good for as many as 62 breeds/varieties. And the numbers were accordingly, 4,598 entries or only a little less than the total number of the 3 groups of the first day. But apart from the World Show, there was also the INTERRA Show, the International Terrier show, with around 600 entries (from what I heard, as there is little information on this). The most numerous breed was the Cane Corso with no less than 317 entries. If we take all the breed varieties together, we get other figures, like the brown and black Dobermanns who ended up with 250 in total and the Brindle and Fawn Boxers, good for 282 in total, 352 Great Danes, 213 Bernese Mountain Dogs and 400 Zwergschnauzers, all colours. Rare breeds were of course not numerous by definition like the 4 Cimarron Uruguayos , the 3 Danish-Swedish Farm Dogs and their 8 compatriots the Broholmers, the 14 Tornjaks, 9 Ciobanesk Romanesk de Bucovina, the 2 Cao Fila Sao Miguel and the 3 Cao de Castro Laboreiro and even as many Kraski Ovcar. Probably due to the overwhelming presence of Russian exhibitors here, it was interesting to see so many of their native breeds - like the 102 Caucasian Shepherds, the 112 South Russian Shepherd and of course the Russkiy Tchiorny Terrier or Black Russian Terrier - good for 132 specimens. A few more popular and well-represented breeds were the Dogo Argentino with 177 entries, the Bulldog with 173, the Bullmastiff with 163 and the Dogue de Bordeaux with 142 dogs to colour that ring, the 114 Newfoundlanders and, 102 Tibetan Mastiffs. It promised to be another long day with 3 groups to go, the Scenthounds and Related Breeds (official name) which is Groups 6, the Pointing Dogs or Group 7 and the Companion Dogs which is group 9. This is a most interesting day as Group 6 has a lot of rare breeds and, even in Group 7, there are some very special ones. 4,297 dogs were competing. And because the 3rd day was also the day of the Eukanuba selection it could take a while and therefore the main ring started rather early in the afternoon. No problems occurred and, as it was a Saturday, there were a lot of visitors and the trade stand holders were finally having a big smile. They were situated mainly in the hall of the main ring where no judging but the finals take place and that is not such an ideal position, especially when the weather is nice and people prefer to stay outside, in the sunshine. The main ring was large enough with one side bordering the Eukanuba Stand. The left side was reserved for the judges and the press while on both other sides large stairs were placed for the public, but even that was not enough for all to sit. The security around the ring was efficient and the stewards did a good job. And the press was given space enough to take a proper shot of every winner. There was no podium and the dogs were only lined up. Most handlers prefer this, as the dog is much more at ease that way. There were not so big numbers to be found, but a lot of most interesting and rare breeds. The best scoring breed was the French Bulldog with 229 specimens. The Beagle was almost as popular with 211 entries. Ridgebacks were also popular with 145 entries as were the Weimaraners with 146 dogs on this show. Of course the Magyar Viszla were numerous, as this breed is probably the best-known amongst the Hungarian breeds. The Rough haired had 70 specimens and the smooth variety 157. The Irish Setter scored also well with 102 entries. In Group 9, we found the Pug as a good competitor in popularity to the Frenchies, there were 180 of them. The Chinese Crested came also close with 178. Both varieties together, the Chihuahua was on top with 154 smooth and 158 long haired or 312 all together, and if we take all Poodle varieties together, we finish even further with 354 for all the sizes and colours. If I would need to sum up all the rare breeds it would take me very far but when you see a Poitevin you automatically say “waow”. A Grand Basset Griffon Vendéen is maybe not so spectacular but is very rare compared to its little brother the Petit Basset Griffon Vendéen. On the next day we would have Group 8, the Retrievers and Water dogs and Group 10, the Sighthounds, followed by the BIS. I knew that we could expect strong competition. The finals! It would be a long day with the 3 remaining groups on term, the International Junior Competition and the Best Junior In Show, the flag ceremony and the BIS judgement. In hours it meant, starting at 3 p.m. and ending at 9 p.m. The weather was excellent again and soon the crowd turned up in between the pavillions. It was very cozy and looked more like a market place than a dog show, as most of the dogs were inside. Notwithstanding the warmth, up to 32°C, it was very bearable due the wind that was air-conditioning the halls. A group of folk dancers gave performances outside and later in the main ring, and many exhibitors were sitting outside with their dogs to have a cigarette or just to enjoy some sunlight instead of staying in the halls all the time. Next to the halls was a huge parking belonging to the horse racetrack and enough to park between 2,500 and 3,000 cars. The motor-homes were parked closer and the Hungarian canine organisation had arranged special spots were handlers could wash the dogs. The trade stand holders who rented a place inside the halls were finally happy. For them it started rather slowly but Saturday and Sunday gave them a good turnover at the end. The nice weather may have had a reverse effect for them as in Hall G -where they were situated- the climate inside was good enough to have a walk around if you were looking for some shelter for a while. Important to say is that the venue was kept clean, inside as well as outside, as this was mostly done by the dog owners themselves. This was leaving a good impression of responsible ownership towards local and foreign visitors. We had a big group 1, the Herding dogs, and two smaller ones, Group 8, the Retrievers and Waterdogs and Group 10, the Sighthounds. High numbers were to be found in the Labradors with 241 specimens and the Golden Retrievers where 271 were competing for the titles. The number of English Cockers was impressive too with 199 dogs and also the American variety counted a nice number of 143 dogs. The Whippets were on top in the Sighthounds Group with 163 ones, more than the popular Afghan Hound with 126 competing dogs. I was very surprised about the high entries in the Piccolo Levriero Italiano (Italian Greyhound) with no less than 119 subjects. No surprises in the Herding Group where the popularity of the Border Collie, Rough Collie and Australian Shepherd is representative of the worldwide popularity of these breeds. They were respectively 151, 131 and 148. The Swiss White Shepherd Dog is the new rising star in this group and had 125 dogs in the rings. This day was the day of a lot of Hungarian Breeds, as Hungary is a country of shepherds, the country of the Poesta, and the National breeds seem to be very popular here. Everybody knows the Komondor, the large dreadlock dog. There were 65 of them on this show. The Kuvasz is a smart breed, large too but with curly white hair. 76 specimens would be enough to give you a good idea of how they look like. The Mudi is a small herding dog, usually solid black and apparently very loved as 123 specimens was a nice number. The Puli is the small dreadlock dog that comes in four colour varities, 149 were defending the national colours there. The little clown of the family is the Pumi, alike the Puli a smart and quick learning dog. There were 125 of them raising their funny ears when paying attention. Hungary has a fine Sighthound, the Magyar Agar, a sturdier version of the Greyhound, a Poesta hunter. There were 68 of them. There were no really rare breeds to mention, except maybe for the Bouvier des Ardennes, a reconstructed Belgian breed, a Wetterhoun and a Deutscher Wachtelhund. And the Barbet is maybe worth mentioning too as not very well-known in general, but this breeds is the very old variety and the basis of the Modern Poodle which in fact is a water dog. In French the poodle is called “Caniche” and a duck is called “Canard”. The ceremonial part was kept very sober except for the above-mentioned folk group of dancers. That brought us quicker to what was really important, the BIS judging. Dr Tamas Jakkel was granted the honour of making the final choice. Mr Jakkel has judged all over the world and has a very long experience in cynology. He is also a member of the FCI General Committee. He finally picked out 4 to be placed. The Smooth Dachshund came on the 4th place, the Fox Terrier Wire was 3rd, his runner up to BIS was the Lhasa Apso and BIS went to the impressive Old English Sheepdog. The least we can say of this show is that the MEOE learned from its mistakes of 2008 and turned this version into a sober but perfect version of how a World Dog Show should be. Excellent in many ways!